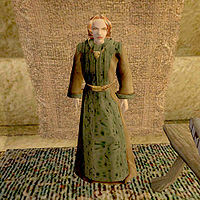 Idonea Munia is an Imperial healer who has a market stall in Vivec's Foreign Quarter Upper Waistworks. There she sells potions and spells to any who need them. If you ask her about "Latest Rumors", she will tell you about some mysterious killings. This page was last modified on 23 November 2018, at 07:31.